Arm the missiles. Load the torpedoes. Line up the bullseye, and launch your attack. 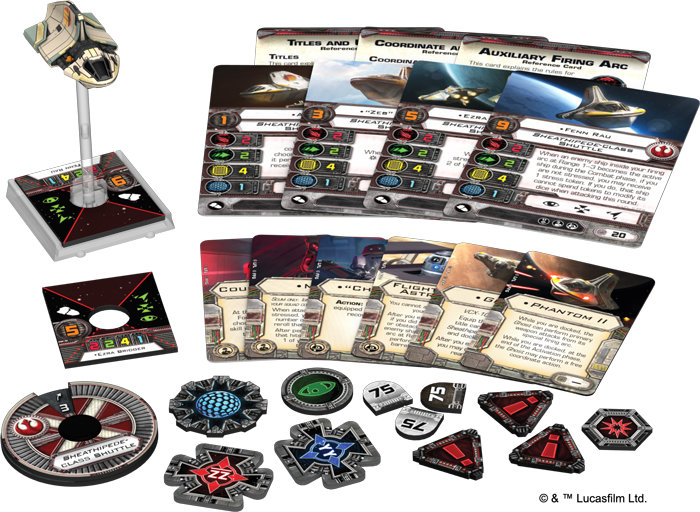 Fantasy Flight Games is proud to announce the upcoming release of three new Wave XII starship expansions for X-Wing™! Arriving for battle with powerful cannons and an arsenal of all the newest ordnance, these Wave XII starships give you all the firepower you need to saturate the skies with your missile salvos. And then you'll be able to reload and do it again! From left to right: The Alpha-class Star Wing, M12-L Kimogila fighter, and Phantom II. 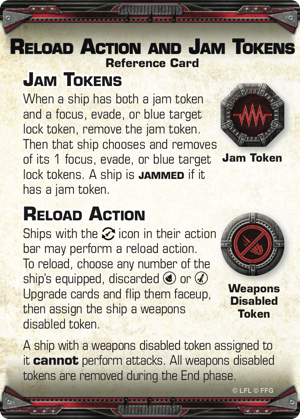 Even as these starships continue to reinforce the central fundaments of maneuvering about the battlefield and lining up your shots, they permit the exploration of new tactics based around reloading ordnance, jamming enemy sensors, and making each shot count. The Empire's first widely deployed starfighter to have shields and a hyperdrive, the Alpha-class Star Wing was limited in its maneuverability, but heavily armed for its size. Designed by Cygnus Spaceworks, the Star Wing was a versatile craft that could be outfitted with powerful cannons or devastating ordnance to rain destruction upon the Empire's enemies. The ship was often assigned to Imperial Navy specialist units that needed a starfighter they could outfit for multiple roles. 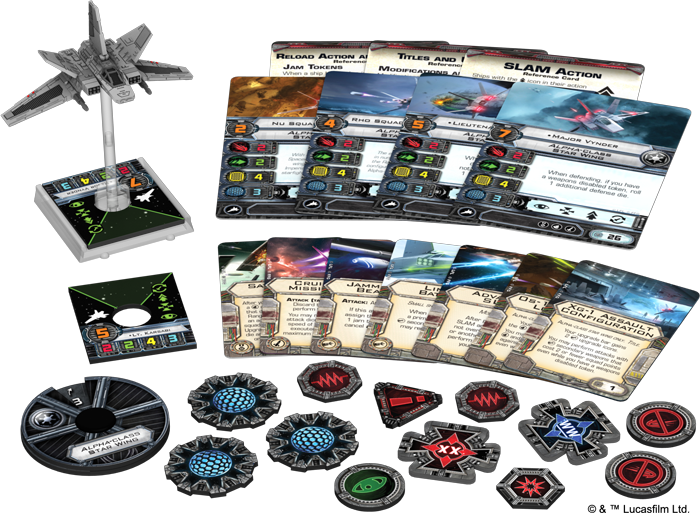 In X-Wing, the Star Wing remains an impressively durable and versatile Imperial starfighter. It comes with two agility, four hull, three shields, and a primary weapon that boasts a modest attack value of two. Still, the Star Wing is bound to hit above its weight class thanks to its devastating arsenal of secondary weapons. The Star Wing comes with the native ability to load both torpedo and missile upgrades, and if you choose to equip the XG-1 Assault Configuration Title, the ship gains two cannon slots, as well. Together, all these weapons upgrade slots make it possible for you to outfit your Star Wing so that it can best perform the exact role you wish it to play in your squadron. Moreover, you don't need to worry that the Star Wing's ordnance-driven sting is only temporary. While the fighter's certainly capable of delivering a blistering alpha strike before fading into a support role, its ability to perform the new reload action means that this long-awaited boost to the Imperial fleet isn't just a one-shot wonder. 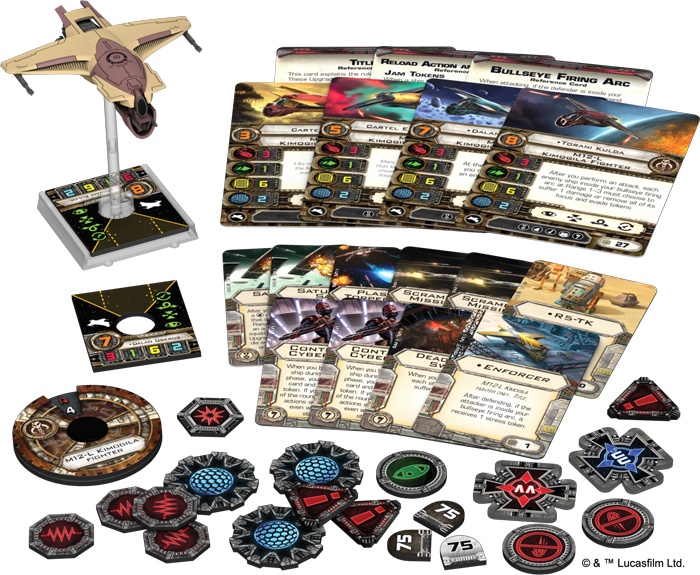 All told, the Alpha-class Star Wing Expansion Pack comes with one pre-painted miniature, four ship cards, seven upgrades, one maneuver dial, reference cards for the reload action and jam tokens, and all the plastic and tokens you need to fly the ship to battle. Produced by MandalMotors and flown by enforcers of the Hutt kajidics and other criminal cartels, the M12-L Kimogila fighter was dreaded by spacers across the Outer Rim for its ordnance capacity and the withering torrents of coordinated fire it could unleash. It was a blunt instrument, trading maneuverability for raw destructive power, but this was a trade that suited its pilots, many of whom were blunt instruments themselves. Along with its pre-painted miniature, the M12-L Kimogila Fighter Expansion Pack brings this fearsome heavy fighter to life in X-Wing as a Scum and Villainy faction vessel with four ship cards and ten upgrades—all focused on catching your foes in your bullseye and pulling the trigger. This is a starfighter that wants to joust. The M12-L Kimogila fighter has a hard time turning sharply, especially in close-quarters, but it excels in the initial, head-on approach and engagement. Its shields and hull make it durable enough to withstand even the most devastating shots your opponent may fire in the initial pass. Then its primary attack value of "3," its ability to load and unleash missiles, and its new bullseye firing arc all combine to ensure your attacks will hit for maximum efficiency. 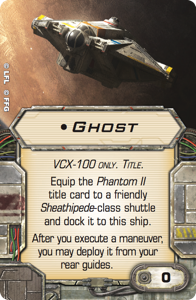 Originally appearing in Star Wars Rebels Season Three when the Spectres recovered it from a Clone Wars-era military base, the Phantom II is a Sheathipede-class transport shuttle that has been heavily modified to include upgraded weapons and a custom docking system compatible with the Ghost. As a result of its upgrades, the Phantom II arrives to X-Wing as an attack-ready vessel with two agility, four hull, one shield, and a primary weapon with an attack value of two that you can fire from either its forward firing arc or its auxiliary firing arc. 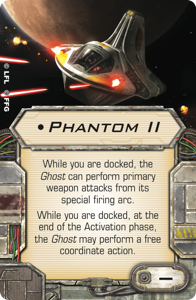 In addition to its pre-painted miniature shuttle, the Phantom II Expansion Pack introduces four ship cards and six upgrades, including new astromechs, crew options, and Title upgrades for the Ghost and Phantom II , many of which add depth to the ship's ability to perform the coordinate action. 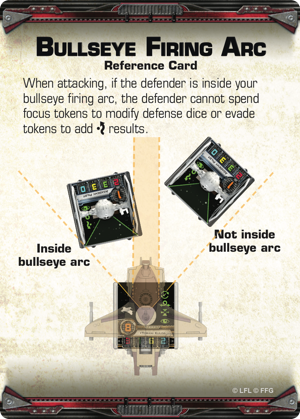 In addition, you'll find a maneuver dial, three reference cards, and all the plastic and tokens you need in order to field the Phantom II in battle. All told, the Phantom II doesn't just allow you to keep up with the changes that Star Wars Rebels Season Three meant for the Spectres; it allows you to pursue a whole range of new, synergistic Rebel tactics—with or without the Ghost in your squadron. The time has come to litter the stars with ordnance. Unleash your missiles. Barrage your foes with torpedoes. Make sure your attack is coordinated from the very first instant of the engagement. With the new ships, upgrades, and actions from X-Wing Wave XII, there's never been a better time to plan your alpha strike. You don't have to wait for just the right moment to strike. You can fire at will. 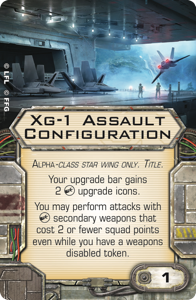 Look for X-Wing Wave XII (SWX69, 70, 72) to arrive at retailers in the fourth quarter of 2017!